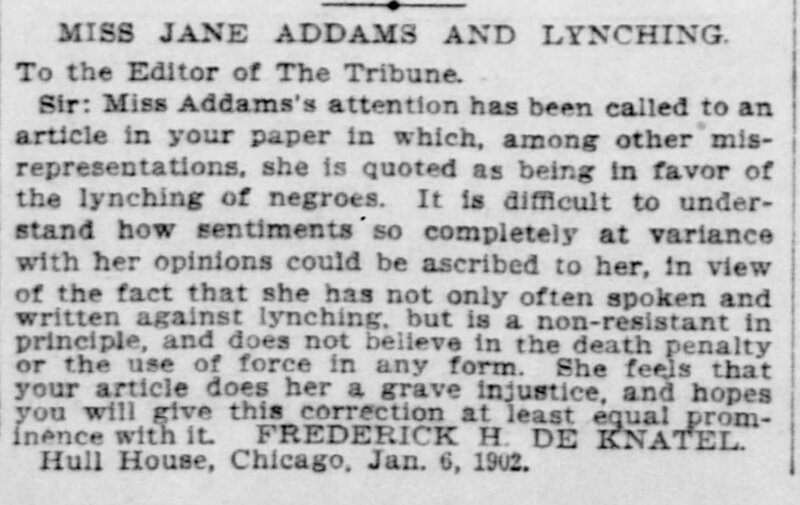 MISS JANE ADDAMS AND LYNCHING. Sir: Miss Addams's attention has been called to an article in your paper in which, among other misrepresentations, she is quoted as being in favor of the lynching of negroes. It is difficult to understand how sentiments so completely at variance with her opinions could be ascribed to her, in view of the fact that she has not only often spoken and written against lynching, but is a non-resistant in principle, and does not believe in the death penalty or the use of force in any form. She feels that your article does her a grave injustice, and hopes you will give this correction at least equal prominence with it. FREDERICK H. DEKNATEL. Hull House, Chicago, Jan. 6, 1902. 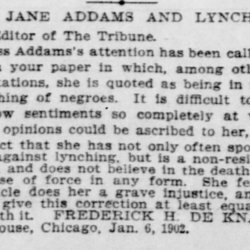 Miss Jane Addams and Lynching, New York Tribune, January 13, 1902, p. 7. Deknatel, Frederick H. , “Frederick H. Deknatel to the Editor of the New York Tribune,” Jane Addams Digital Edition, accessed April 22, 2019, https://digital.janeaddams.ramapo.edu/items/show/15812.